If you want a mat to last you a lifetime, and can also tick the boxes for grip, portability, and comfort, the Manduka PROlite is the way to go. This mat beat out its category contenders for longevity by a landslide. It’s an extremely durable, high-performing mat that’s stamped with a lifetime guarantee. Yoga teachers everywhere (including myself) agree that the Manduka PROlite gets better with age the more you use it, similar to a baseball glove. I’ll get upside-down to that. The PVC material and density of the mat make it competent under any condition — outdoors, in a heated room, in a non-heated studio, and with gentle-to-vigorous practices — which can’t be said for the majority of the mats tested here. I took this mat through a multitude of restorative and standing poses, sun salutations, arm balances, and inversions. I’m not the only one who ranks this mat at the top of the list. Boston’s 2014 Best Yoga Instructor and Owner of Sadhana Studio, Cunningham, has been using the Manduka Pro series mats for 14 years. I’ve been using Manduka mats since 2001 and I still think they make the best overall mats out there in terms for grip, comfort, thickness, feel, size, and durability. I’ve been teaching for over 15 years and see a lot of ‘mat shrapnel’ on the studio floor, but I’ve never seen a Manduka Mat get worn out. In asanas that tend to be slightly harder on the knees, like Ustrasana (camel pose) and Anjaneyasana (low lunge), this mat provides just the right amount of support and cushion to feel ease and comfort throughout the pose, even when held for long periods of time. The mat also provides stabilization and joint protection during asanas that require more stability, balance, and impact (think: Tree pose, handstand, and jumping back to chaturangas). At the same time, it won’t compromise the ability to feel stable and connected to the ground. As far as texture, grip, and comfort go, I give this mat two thumbs up. The slip-resistant traction kept fidgeting to a minimum. The surface, which isn’t super sticky, allowed for gliding transitions through quick vinyasas. The transition to take my foot into or out from a lunge felt effortless compared to when catching or sticking on mats made from a different textile (like some of the natural rubber mats did). Other than the first couple of uses during the “break-in period,” the manual labor for this mat is practically nonexistent. Its closed-cell technology makes it incredibly easy to clean and wipe down after class, and with a weight of around four pounds, it’s light and easy to carry. The mat comes in an assortment of colors and in two different sizes (71 and 79 inches) to accommodate style preference as well as the taller yogis out there. It’s fairly pricey for a yoga mat, but with a lifetime warranty, it provides outstanding value. Manduka PROlite is always my go-to. It’s easy to travel with, stays good for years, and [is] easy to clean since I’m a sweaty mess! I don’t always use a towel because I don’t need one with this mat. It’s awesome! Don’t just take my word for it, though. Based on research, and many conversations with other yoga practitioners, the Manduka company is considered the holy grail of yoga-mat brands. It continuously tops the charts in reviews. The Manduka PROlite series is a lighter, more portable version of the beloved Manduka Black Mat Pro, which has been on the market for 15 years. The PROlite mat receives accolades from a number of magazines and popular publications. It was voted the Top Pick Award by OutdoorGearLab, voted a “must have” by Yogi Approved, and is sold and used by the most popular yoga studios across Boston, New York City, and Los Angeles. CorePower Yoga Orange County’s regional manager, Calvert, says the Manduka PROlite is her favorite, and it’s the one the company carries in its studios all across the United States. We see over 500 clients a week using our Manduka mats for barre and yoga. I teach on them and take class with them, and I have no complaints — they are super durable. We used to have Jade, but switched to Manduka because they are better performing overall. Barre & Soul Studios, found in several locations around the Boston area, provides the Manduka PRO series mats to its members for use in class. Yoga classes done in a heated studio are popular today (and let’s face it, many of us continuously perspire holding Warrior II), so I wanted to find a mat that would provide the best stick under super-sweaty conditions without having to rely on the use of a towel. Enter the Liforme Yoga Mat. The mat has attracted plenty of notice on social media thanks to its distinct visual appearance, with alignment markers etched directly onto its surface. As a yoga teacher, what I most love about the Liforme yoga mat is it's unique alignment system that self-teaches the practitioner proper alignment. As a student, I love the incredible grip and traction, and how it's equally great for high-intensity, hot, and restorative yoga. Liforme offers a grippy surface that was unmatched by any other brand I tested (although Yoloha, below, came close). The mat has a natural rubber base, topped with a layer of polyurethane, a material that’s very good at absorbing sweat — hence the no-slip grip. No breaking-in period was necessary. I got perfect traction straight out of the box and never felt like I was in danger of falling. The mat itself also stayed put, even on a slick hardwood floor. The Liforme is 4.2mm thick, offering a middle-of-the-road balance between no give at all and feeling like you’re practicing your asanas on a Tempurpedic. It’s a couple of inches longer and wider than the Manduka PROlite, and while I appreciated the extra room, it does mean the mat is on the heavier side, at 5.5 pounds versus the Manduka PROlite’s 4.6. At $140, the Liforme is also an investment — but if hot yoga and heavy sweating are part of your weekly routine, it’s one worth considering. Like the Lifeforme, the Yoloha Native Yoga Mat has a non-stick surface designed to accommodate hot yoga and lots of sweating. But this mat gets its non-slip powers from a surface of cork and recycled rubber. A little unusual, yes, but cork is naturally antimicrobial, helping to minimize odor and kill the bacteria attracted to your sweat. Despite being 6mm thick, the Yoloha Native is also more lightweight than the Liforme (4 pounds, versus Liforme’s 5.5), making it easier to roll up and take with you. It comes with a carrying strap made of natural fibers, which I found a little uncomfortable — I’d probably spring for a case if I used the mat regularly, but the strap does have a minimalistic appeal. The Native performs very similarly to the Liforme, providing plenty of support through a variety of poses. Because it’s made of rubber and cork, however, the texture is slightly more tacky, which can take some getting used to. Cork becomes more grippy as it gets wet, so if you don’t sweat much but still want a rock-solid grip, you might consider misting the mat with water before you start. I also appreciated Yoloha’s commitment to being eco-friendly. Cork is a renewable resource in the truest sense of the word: the bark can be harvested every 3-5 years without harming the tree. My mat was also shipped with minimal (and totally recyclable) packaging, and the company included a plantable pear seed with my order. Like your practice, your yoga mat should be one that you invest in, one that you keep coming back to, and one that supports you through every inhale and exhale. It should feel like a little island you want to call home for every practice. The Manduka PROlite allows me to take my practice in a variety of settings and teach to a number of yoga styles, while ensuring a long-lasting relationship with my mat. Another favorite among yoga professionals, the Jade Harmony Professional Mat is a heavy duty mat made of 100 percent rubber. If things get extremely hot and sweaty, I suggest turning to Liforme Yoga Mat to ensure you don’t slip and slide around. Don’t be afraid to test a few mats on your own and ask around before making a purchase. 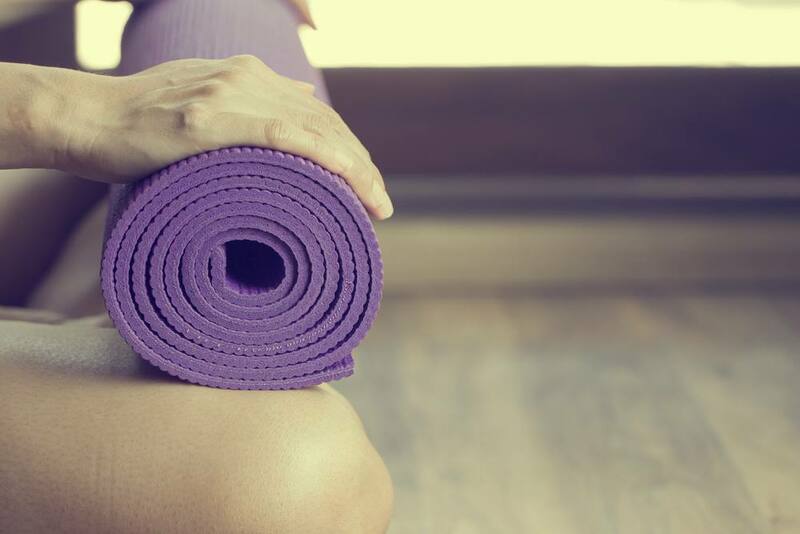 When a yoga mat feels just right for you, it can make all the difference in your practice.